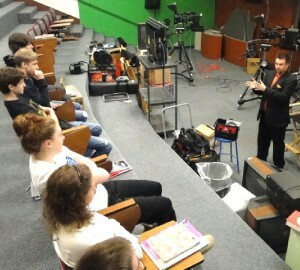 OSWEGO, NY – Chris Watson, YNN sports anchor and ESPN announcer, visited the Oswego High School recently to discuss sports broadcasting with students of WBUC. Watson, a former sports announcer at WBUC, has worked in the broadcasting field for several years and was able to share his experiences. He also answered numerous questions about the competitive field. Watson spent the majority of his years serving Central New York, but has moved to the Capital District.